The Caribbean nation of St. Kitts and Nevis recently garnered additional fame as the birthplace of Alexander Hamilton, thanks to the hit Broadway musical inspired by his life. It’s also the location of billionaire car dealership magnate Ernie Boch, Jr.’s gorgeous home, which just hit the market for a whopping $ 7.2 million. The 4,828-square-foot, two-story home features five bedrooms, 6.5 baths, a pool, guest cottage, and unparalleled views of the ocean. Designed by acclaimed designer Anthony Catalfano, it’s situated in Nevis’ exclusive Four Seasons Resort Estates and includes access to all of the resort’s top-of-the-line facilities. Let’s get an inside look at the villa’s panoramic vistas and high-tech amenities. Called Seagrape, the villa is set at the end of a cul-de-sac, making it the ultimate in privacy and seclusion. This stunning front hall welcomes guests to the island paradise. Built in 2009, Seagrape boasts a variety of high-tech features, including a Crestron smart home system for lighting and audio-visual appliances. The airy living room is a perfect mix of modernity and laid-back island life. There’s plenty of room for guests and family: five bedrooms and 6.5 baths mean all are welcome, and gathering spaces are built for entertaining. This screened-in veranda showcases one of the house’s most impressive features while keeping out pesky bugs. Sitting 300 feet above sea level, Seagrape gets the best of the Caribbean breezes. Designer touches appear throughout the house, including sinks by Robert Jones Aqua. The kitchen is sleek and user-friendly. The master bedroom is spacious and outfitted in British West Indies style. As in the rest of the house, it flaunts custom carpets and fabrics by Boussac, Pierre Frey, Brunscwig & Fils, and Lee Jofa. All bedrooms in the house have their own en-suite bathrooms. In case you need more space for your guests, the adorable guest house includes everything they need to enjoy their stay to the fullest. Since the property spans 1.25 acres, everyone can have space and privacy. The guest cottage bedroom also opens up to breathtaking views of the Caribbean Sea. 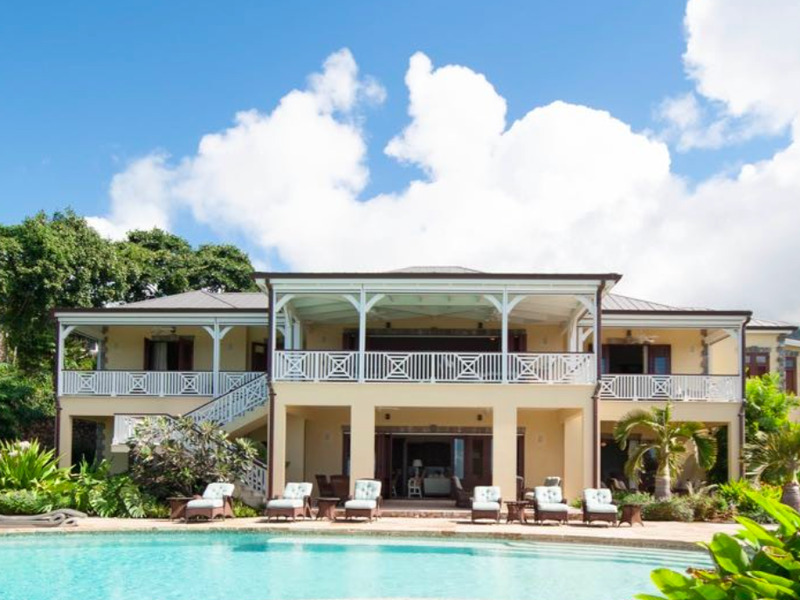 The coolest thing about the villa may be the fact that buying it will make you an automatic citizen of St. Kitts and Nevis. Benefits include a lifetime St. Kitts and Nevis passport, visa-free travel to over 120 countries including the EU, and no direct personal taxes whatsoever. This entry was tagged $7.2, Billionaire, Broadway’s, Hamilton, Home, Inspired, Island, magnate, Million, selling. Bookmark the permalink.